Don’t be fooled by fake pages! If it looks to good to be true, it probably is! *I have updated this since Facebook has lifted some restrictions on “like and share” giveaways. *I have left a link on the latest about “liking” giveaways as Facebook recently changed its rules making it so pages can no longer ask people to “like” their page to win something. Lately, I have been seeing a lot of these pop up in my newsfeed. 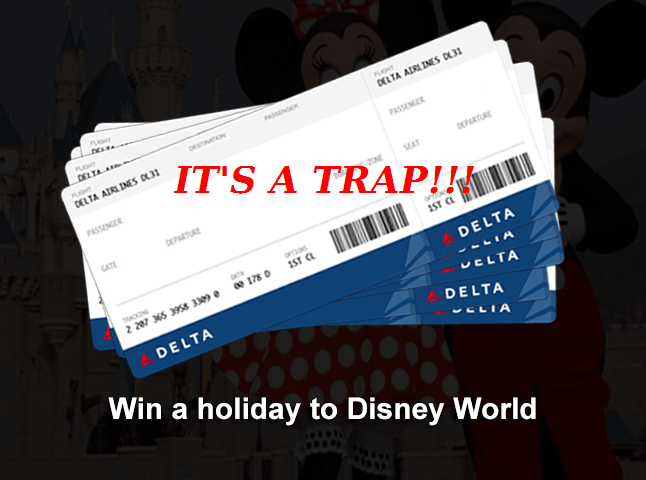 A company is giving away passes to Disney World! You can win a free I-Pad! All you have to do is “like” and “share.” However, before you “like” that post, ask yourself the question: “Is this real?” If it sounds too good to be true, it probably is. That picture comes from a scammer page on Facebook that I had seen via a Facebook friend earlier today. These are popping up more and more. They look like Disney or in this case, Delta Airlines. However, they are fake pages being used to lure people into “liking” them for shady purposes. If you look at the description, you may notice grammatical errors, fictitious websites, or event tiny urls in the description. Also, if you look at the Facebook URL, itself, it may have a group of numbers after the name, instead of just the name. I am pretty sure that Delta, Disney, Apple, and other companies have social media consultants that wouldn’t make such rookie mistakes. Not only that, check how many followers the page has. Check out when the page was made. Do you think Disney or Delta would have only a few thousand followers? Probably not. While it sounds awesome to win something like a vacation, you have to ask yourself, “Does this sound too good to be true?” If so, it probably is. The bottom line is this: Facebook may have lifted some of its restrictions on “like and share” giveaways, but these fictitious ones are still popping up. Be careful about what you share. Those sites might be phishing. Have you seen these contests on Facebook? If you spot a scam page, make sure to report it. Also, please feel free to share your experiences in the comments section. AH, so I’d always heard that “likes” are ok as long as they ARE NOT mandatory. When I entere contests, I don’t like anyone thing, I like the ones I’m interested in, not just any, so there’s no pressure whatsoever, as long as there are other options, that don’t merely consist of liking. I had read on a legal site that’s NOT consideration because you’re not forced to like or share by entering. Yes, it’s one thing if you put on your blog or a rafflecopter giveaway that you get an extra entry for “liking” a page, but you can’t go on Facebook and say, “Hey, Like my page, and you can win x,y, or z.
I have seen a few small businesses and boutiques that have done the whole “like and share” this photo for a chance to win. Those definitely violate the FB policy. Oh I see what you’re saying. Yup, totally agree! I get so annoyed when I see those. And so many of my friends share and like! Ahh! They say “Can’t hurt to try” but I see the downfall. Just like all those “1,000,000 likes and my dad quits cocaine!” photos. Terrible. Some of my friends say the same thing. For me, I worry about the risk of personal information being compromised. I go as a pseudoname on Facebook for that reason.